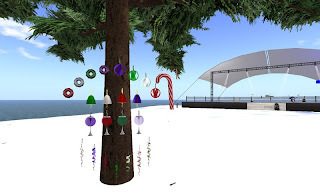 Over the next couple of weeks, small seasonal items will appear under the tree on Virtually Live. They are copyable, so please stop by and enjoy. Here is a small collection of simple two and three prim ornaments using just blank or silver gradient textures. Enjoy!